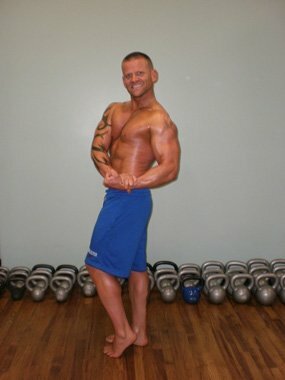 Body Transformation: Joshua Aurelius Owns The 2011 BSN Elite Physique Transformation Challenge! Joshua Aurelius didn’t give up after suffering a major spine injury. Discovering the BSN Elite Physique Transformation Challenge was Joshua’s ticket to a better life. In October 2009, Joshua Aurelius was involved in a car accident that left him with a severe spinal injury. To fix the damaged vertebrae, surgeons subjected him to a 2-level spinal fusion in his lower lumbar in 2010. He was out of commission for several months. Depression and weight gain followed. At his lowest point, Joshua weighed more than 230 pounds with 30 percent body fat. His rehabilitation was strenuous, but it worked. He regained strength in his back. Then a friend told him about the 12-week BSN Elite Physique Transformation Challenge on Bodybuilding.com. Being a competitive person, Joshua went all in. Joshua began the program weighing 221 pounds with 30 percent body fat. When the 12 weeks finished, he was down to 176 and 9 percent. Now, the 39-year-old feels like he's 25 again, and his back pain has greatly diminished. The contest helped Joshua create and sustain healthy habits. He can safely play with his four children and fully enjoy his beautiful wife of five years, Christina. For Joshua, the future looks bright. He's currently studying psychology and biology at Northeastern State University in Broken Arrow, Oklahoma, and will graduate this year. Then he plans to begin a master's program focusing on diet and nutrition. He plans to test his body's true potential at a bodybuilding competition in June. Josh kicked the keg and picked up an 8-pack. Joshua worked in the restaurant industry for the majority of his adult life, which equated to terrible nutrition habits. But the restaurants also had a positive impact on Joshua's life; they turned him into a cooking handyman. Kicking pesky eating habits was difficult for Joshua at first, especially throughout the holiday season, but when visible changes appeared he was off! Joshua persevered by training his mind to associate ice cream and cookies with the back pain he felt during those brutal years. He didn't want to feel like that ever again, and so far he's off to a great start! Joshua's training began every morning with 30-45 minutes of cardio between 6:30 and 7 a.m. His workouts were fast-paced, causing him to sweat more than he would on the stairmaster. On cardio days, he came back to the gym in the evening for another 20-30 minutes of cardio. Joshua created his own arm and shoulder workouts consisting of timed drop sets. Joshua contributes most of his success to a proper diet and spot-on supplementation. With that attitude, he will never be subjected to a recliner again. He looks forward to pushing his body even further and helping others overcome obstacles and accomplish their dreams. If you set a goal to complete 30 minutes of cardio, do the full 30 minutes! There were countless times that I wanted to stop at 28 minutes, but I didn't want to cheat myself. Set a goal and stick to it! Tell people about your goals and they will ask you how things are going. It's motivating when someone recognizes and congratulates you on your progress. "No Excuses!" I could've easily failed after doctors told me over and over again that I'm 42-percent disabled. Find what's holding you back and use it to fuel you! I'm in the best shape of my life at 39-years old. The motivation that comes from how I feel inside and out is so hard to describe, but a 1-word description sums it up best: Fire! Plan ahead, make meals early and get good workouts in. Pack workout clothes with you so you can go straight to the gym after work. When you get home from a long day it's hard to find motivation to go to the gym. Eliminate this problem by not going home until the real work is done!